You add an extension by selecting the one you want from a list of available extension packages for the Apigee Edge organization. Open the New Edge experience in a browser. The Extensions view displays a list of all extensions that have been configured from extension packages available on the system. In the next steps, you'll add your own extension. The Select an extension view displays. This page lists all of the extensions available on the system. The extensions in the list are divided between those developed by Google and those developed by other companies. To make an extension available for use from an API proxy, you select an extension package, configure an extension with values specific to your needs, then deploy it to an environment. You'll do that in the next steps. 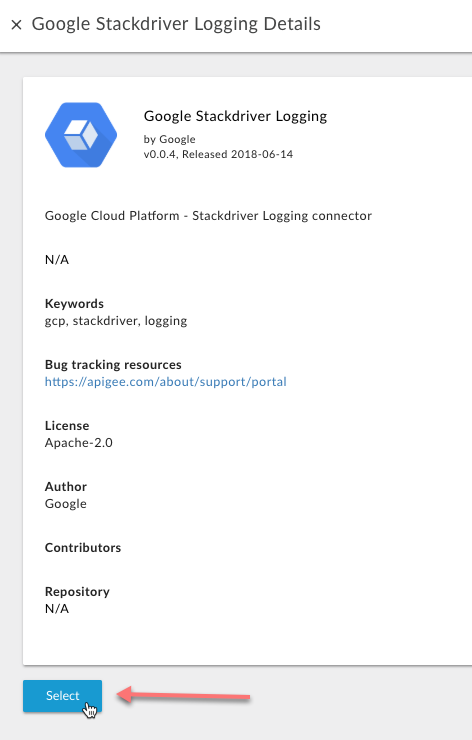 On the Google tab, locate the Google Stackdriver Logging extension package. In the extension's details view, you can find information about the extension's author, license, source repository, and so on. Name Required Enter a name for this extension, such as "my-logging-extension" (don't use spaces or special characters). This value must be unique in the organization. In your own extensions, try to use a name that says something about what the extension configuration does. 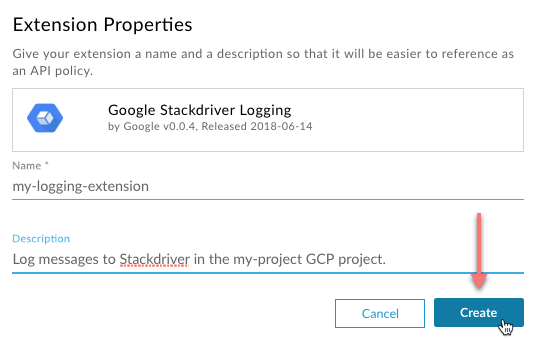 Description Optional For your own extensions, enter a description that will help an API proxy developer understand what this configuration of the extension does. Remember that it's possible for there to be multiple configurations of the same extension in an organization. Imagine you're telling the proxy developer what the extension is for. Edge creates your new extension. You've add an extension to your organization. Next, you'll configure and deploy.